For other uses, see Aerodrome (disambiguation). An aerodrome (Commonwealth English) or airdrome (American English) is a location from which aircraft flight operations take place, regardless of whether they involve air cargo, passengers, or neither. Aerodromes include small general aviation airfields, large commercial airports, and military airbases. A water aerodrome is an area of open water used regularly by seaplanes or amphibious aircraft for landing and taking off. According to the International Civil Aviation Organization (ICAO) an aerodrome is "A defined area on land or water (including any buildings, installations, and equipment) intended to be used either wholly or in part for the arrival, departure, and surface movement of aircraft." The word aerodrome derives from Ancient Greek ἀήρ (aḗr), air, and δρόμος (drómos), road or course, literally meaning air course. An ancient linguistic parallel is hippodrome (a stadium for horse racing and chariot racing), derived from ἵππος (híppos), horse, and δρόμος (drómos), course. A modern linguistic parallel is velodrome, an arena for velocipedes. Αεροδρόμιο is the word for airport in Modern Greek, which transliterates as aerodromio. In British military usage, the Royal Flying Corps in the First World War and the Royal Air Force in the First and Second World Wars used the term—it had the advantage that their French allies, on whose soil they were often based and with whom they co-operated, used the cognate term aérodrome. In Canada and Australia, aerodrome is a legal term of art for any area of land or water used for aircraft operation, regardless of facilities. In the early days of aviation, when there were no paved runways and all landing fields were grass, a typical airfield might permit takeoffs and landings in only a couple of directions, much like today's airports, whereas an aerodrome was distinguished, by virtue of its much greater size, by its ability to handle landings and take offs in any direction. The ability to always take off and land directly into the wind, regardless of the wind's direction, was an important advantage in the earliest days of aviation when an airplane's performance in a crosswind takeoff or landing might be poor or even dangerous. The development of differential braking in aircraft, improved aircraft performance, utilization of paved runways, and the fact that a circular aerodrome required much more space than did the "L" or triangle shaped airfield, eventually made the early aerodromes obsolete. The city of the first aerodrome in the world is a French commune named Viry-Chatillon. The unimproved airfield remains a phenomenon in military aspects. The DHC-4 Caribou served in the U.S. military in Vietnam (designated as the CV-2), landing on rough, unimproved airfields where the C-130 workhorse could not operate. Earlier, the Ju 52 and Fieseler Storch could do the same, one example of the latter taking off from the Führerbunker whilst completely surrounded by Russian troops. 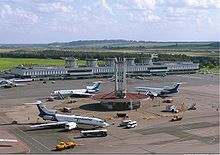 An airport is an aerodrome certificated for commercial flights. An air base is an aerodrome with significant facilities to support aircraft and crew. The term is usually reserved for military bases, but also applies to civil seaplane bases. An airstrip is a small aerodrome that consists only of a runway with perhaps fueling equipment. They are generally in remote locations. Many airstrips (now mostly abandoned) were built on the hundreds of islands in the Pacific Ocean during World War II. A few airstrips grew to become full-fledged airbases as strategic or economic importance of a region increased over time. An Advanced Landing Ground (ALG) was a temporary airstrip used by the Allies in the run-up to and during the invasion of Normandy, and these were built both in Britain, and on the continent. A water aerodrome is an area of open water used regularly by seaplanes or amphibious aircraft for landing and taking off. 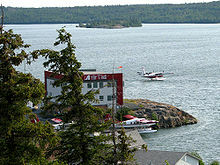 It may (for example Yellowknife Water Aerodrome) have a terminal building on land and/or a place where the plane can come to shore and dock like a boat to load and unload. The Canadian Aeronautical Information Manual (AIM) says "...for the most part, all of Canada can be an aerodrome", however there are also "registered aerodromes" and "certified airports". To become a registered aerodrome the operator must maintain certain standards and keep the Minister of Transport (Canada) informed of any changes. To be certified as an airport the aerodrome, which usually supports commercial operations, must meet safety standards. Nav Canada, the private company responsible for air traffic control services in Canada, publishes the Canada Flight Supplement (CFS), a directory of all registered Canadian land aerodromes, as well as the Canada Water Aerodrome Supplement (CWAS). Casement Aerodrome is the main military airport used by the Irish Air Corps. The term "aerodrome" is used for airports and airfields of lesser importance in Ireland, such as those at Abbeyshrule; Ballyboughal; Bantry; Birr; Inisheer; Inishmaan; Inishmore; Newcastle, County Wicklow; and Trim. Look up aerodrome, airstrip, airfield, airport, or airdrome in Wiktionary, the free dictionary.